Crafted using good-quality goose feathers with a durable foam head of this White Badminton. Goose Shuttlecocks is for club match or club play Ideal for practice and casual playing Specification: Speed Rating: 79 Color : Black Weight : Approx 6g (Each one ) Material : Goose feather Package Include: 12 x Badminton Balls (in one tube) Brand Unbranded MPN Does not apply UPC 4894462274743 EAN 4894462274743 ISBN 4894462274743. Original as found and pictured condition. The length of each overgrap is more than 110cm and hence should be good enough for tennis racquets as well. Model AC102EX. The color is white; no other colors. The leader in racket technology - Yonex. This orange and gray racket with head-light balance. This racket is in excellent condition - no scratches or signs. 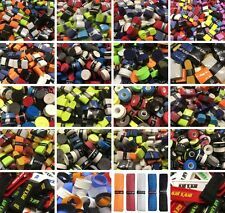 of use other than the grip tape (see photo), which is. The official racket for the Korea National Team! Includes Victor full racket cover. Manufactured by: Victor Taiwan. Shaft Material:Ultra High Modulus Graphite Nano Resin 7.2 SHAFT. 4 Rare Vtg NOS Unstrung All Wood Badminton Rackets Rossignol Strato Bancroft NR! They are unstrung and look like they have never been used. One Bancroft has a cushioned grip. We encourage you to reuse and/or recycle whenever possible. We must be notified of any issues within 24 hours of receiving your item. Set is missing the net. Rackets have age spots & a couple faces have a couple strings that are starting to fray, but they still work just fine. The 2 plastic shuttlecocks are made in England and don't appear to have ever been out of the container. 3e OPEN DE France DE BADMINTON. Affiche Badminton 1989. 21-26 Mars 1989 – Halle Carpentier. Envoi soigné sous tube rigide en colissimo. Lightweight portable stringer can be conveniently used anywhere. The Klippermate is used by more players than any other stringer. Join thousands who save money each year by stringing their own racquets. Used excellent shape. I know nothing about badminton but this looks in excellent shape. The newest generation of the Speeder displays outstanding flight characteristics: Small waves at the end of the shuttle facilitate rotation, providing the Speeder with more precision and stability during the flight. Multi-colored: 2 blue, 2 yellow and 2 white. Perfect new condition - see photos. Set includes 2 racquets and 2 nylon shuttlecocks and a case. VICTOR badminton net, A grade, C-7004A, BWF approved. This is for standard badminton courts. LI-NING WOODS N90 Badminton Racquet w/ Case Excellent Condition PRO LEVEL!! Hard to find a scratch on the racquet, it is lightly pre-owned. 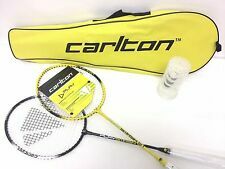 Carlton Powerflo 700GR Badminton racket, very good condition! This is a Carlton Powerflo 700 GR badminton racquet in very good condition. Strung with Carlton High Tension string in good condition. Has a new Yonex soft feel overgrip installed. Best Choice Products 13.8'x5' Portable and Height Adjustable Badminton and Tennis Net w/ Carrying Bag. Use for tennis, badminton, and more. Included nylon carrying case. Adjustable net can be raised/lowered. Made in England.One has a slight tear in the "feathers.". See photos for details. RARE Yonex Badminton Racket Aerotus 100 Widebody w/ Case CLASSIC! 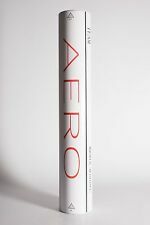 This is a CLASSIC Yonex Badminton Racket Aerotus 100 Widebody w/ Case. The grip will need a new wrap. Good Luck! This Optima full size pickleball net is designed to bet setup and taken down quickly so you can play pickleball wherever you like. Item requires assembly. It may shows signs of use and/or be missing accessories. 3 Shuttlecocks Sealed in 1 Original Cardboard Tube Container. This is great first racket. It has been used but has a lot of life left in it. please look at my other items and I do combine shipping. Feel free to ask any questions you may have. Payment is due two days after purchasing. Good luck! New, but without original box. Material: Ultra Hi-Modulus Graphite. Balance point: abt. Weight: abt. Yonex EZONE 100 (300g) Tennis Racquet - Lime Green Size 3-. Condition is Used. Shipped with USPS Priority Mail. Best way to introduce racquet sports to children | Play over a badminton net for competitive fun | Simple, easy, and ridiculously fun! Every tool you need to string your racket. A must-have accessory! - 360-degree Rotating Racket Plate. Versatile design for a range of racket sizes and types. - Load Spreader Set. Evenly disperses stringing forces for maximum protection. The item is for 2 tubes, each tube has 12 shuttlecocks. Sorry for the inconvenience.